As the 2017/18 Elks year comes to an end I’m discovering again that we are a very lucky lodge. To have so many great members stepping up and helping out, making one little part of the lodge their pride and joy, is absolutely amazing and unheard of in many lodges around the country. So this month I’ve watched members jumping up and saying “I’ll help out, what can I do?” Every time I turn around someone is offering their time to this committee or that. 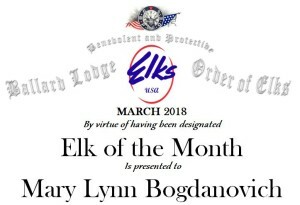 This particular member’s actions have been noticed by so many members around the lodge that no less than 4 Elks have nominated her for Elk of the month in the past few weeks. Her Proposer, Todd Marvin, will be proud to know that he brought into our lodge someone with the energy and dedication to our order that other members are noticing – and she has done this in less than three short months since she was initiated in January of this year, 2018. Mary Lynn Bogdanovich, you have achieved something only one other member of this lodge has achieved this year in such a short time as a member. Your enthusiasm, energy and can do attitude is being noticed by your fellow members to the point they are taking the time to talk about your efforts and recommend you to others for your service to the lodge. Your actions are causing other members to make that extra effort they otherwise may not have chosen to make. You are not only giving yourself pride in our lodge but by your actions are giving other members that same feeling of pride in our organization. 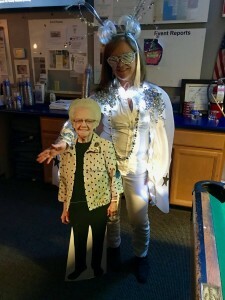 Since joining in January 2018, Mary Lynn has not only come to the lodge meetings she has jumped to help with any event she can. If my memory is correct she helped set up the tables for her own initiation dinner! We found her knee-deep in our February kitchen shut down helping our kitchen committee with everything from the least desirable jobs to the sprucing, polishing and organization it needed. This past month Mary Lynn traveled to visit with her daughter in the mid-west and is taking the time to go to the nearest lodge meeting to her daughter’s house because she would be missing our early March meeting. 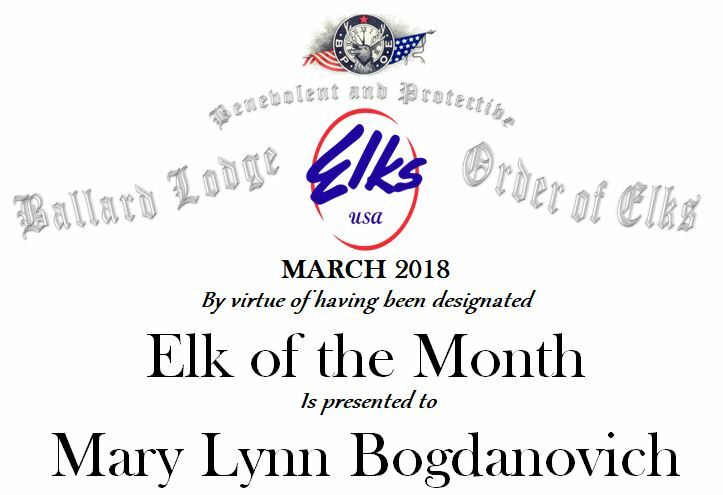 This is the love and dedication to our order that not only makes a member stand out and shine as Elk of the Month it motivates other members around her to do more for the lodge. To make that extra little effort because of the admiration they have for a fellow member’s enthusiasm. This is the down in the trenches definition of community service through a benevolent organization. Thank you, Mary Lynn, for joining our great order and stepping up, asking how you can help and following through with some amazing effort. We do what we do as Elks not for recognition or personal gain but for the greater and nobler good of the lodge and the community we live in. I know that these members didn’t step up and volunteer to be rewarded for their efforts but never the less we will thank these members and by doing so can develop a pool of eligible recipients for the coveted Elk of the Year Award given each year to the member who is always willing to help, the member our lodge can rely upon to step up and get things done. Congratulations and thank you Mary Lynn – keep up the great work and excellent can-do example for our members! 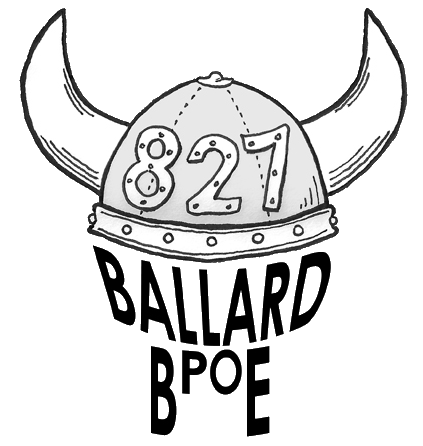 This entry was posted in News & Publicity, Blog, Members and tagged Elk of the Month, Ballard 827, Mary Lynn Bogdanovich on March 27, 2018 by admin.